Despite the fact Fame was written more than 30 years ago, the musical is more relevant for society than ever. The eerie similarities between the life of the main character, Carmen, and recently deceased pop sensation Whitney Houston are just one reason to check out the Unionville Theatre Company’s performance of the Fame: The Musical, Feb. 22 to 26 at the Markham Theatre. What should give area residents even more motivation to reacquaint themselves with this classic is it showcases local talent. “People should come just to see the talent we have from within the community,” theatre company president Carlene Flynn said. The group is celebrating its 33rd year of local theatre. This year’s show boasts 52 cast members, a 12-person orchestra and more than 200 volunteers. This is 20-year-old Mayla Donachie’s first year performing with the company. She said the atmosphere at rehearsals is perfect for learning. The theatre company has been working on the show for five months, Ms Donachie said, adding that depending on the character, performers could be rehearsing 15 to 17 hours a week. In fact, tomorrow’s rehearsal is scheduled from noon to 11 p.m.
About 80 per cent of the cast is 12 to 25 years old. She said the show is still very relevant to today’s youth. 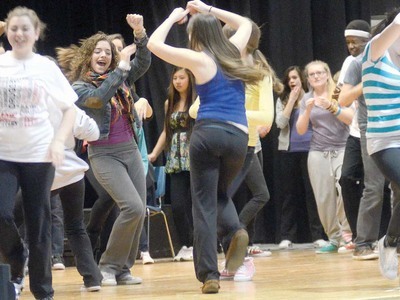 Ms Cline, 34, a teacher at Westmount Collegiate Institute in Thornhill, is a cast veteran.